The Col’Cacchio Celebrity Chef Series raised R120 000 last year for the Red Cross War Memorial Children’s Hospital. They plan to beat that this year. 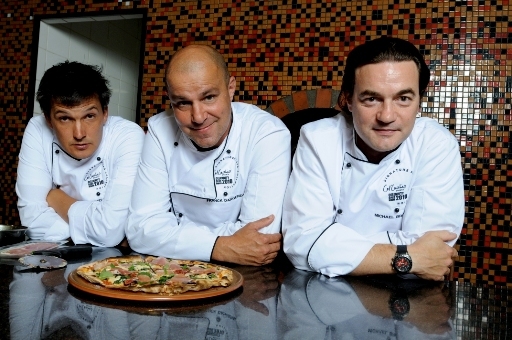 Col’Cacchio invites six top South African chefs to produce a gourmet pizza, one creation on offer each month for six months (April to September). As it is 2010, this year each chef will ‘represent’ a participating country in the upcoming soccer showcase. The celebrity chefs this year, three male and three female, are: Michael Broughton (Terroir), Nicky Gibbs (The Westcliff), Jodi-Ann Pearton (The Food Design Agency), David Higgs (Rust en Vrede), Chantel Dartnall (Restaurant Mosaic) and Franck Dangereux (The Foodbarn). R5 from every gourmet celebrity pizza sold goes to the Children’s Hospital Trust, a 100% of the donations going to upgrade the Burns Unit. This ward admits over 1300 severely burned patients annually and has not been upgraded since 1956! What better reason to go and get a pizza! If we were not so alienated from the source of our food and completely ignorant of how its evolution is accelerated to our plate, we’d recoil in disgust. This is the view of Michael Pollan in his bestseller, The Omnivore’s Dilemma, a riveting piece of investigative journalism into the murky world of industrial agriculture in the United States. In it, he follows the journey of corn from laboratory seed to cereal flake, and a steer from birth to slaughter. Agribusiness is so out of sync with nature, it is poisoning not only Americans, but the planet. Industrial fertilizer washed down the Mississippi into the Gulf of Mexico has created a hypoxic zone destroying all marine life for 20 000 square kilometres. Food in the USA is riddled with antibiotics, petrochemicals, and genetic manipulation (the results of which are indeterminable). All these horrors of production, are absorbed by people. His basic thesis is: we are what we eat and by implication we are what we eat ate! Pollan is no polemicist, but once you’ve read him, you start to rethink your relationship with food; though I must admit, as a child I was less than pleased to discover milk came squirting out of a cow’s udder and not from a shapely glass bottle. ‘Slow Food’, the Italian-born, worldwide movement against globalised food culture, is celebrating their 20th year. A lobby for sustainable, small-scale, diverse, ecologically sound farming practices, it aims to preserve culinary traditions and promote local farmers’ markets. Farmers’ markets have sprung up all over cities in the USA. I visited one in LA with small pens of livestock to teach the city kids the difference between a sheep and a goat. To be honest, the real appeal of slow food is not its ethical altruism, leftist revolutionary zeal, or even saving the planet, but the gluttonous promise of tastier, all-you-can-eat healthy, gorgeous food. Such connoisseur interests are catered for at the food market in the converted Old Biscuit Mill in Woodstock. Here at last, I found the kind of olives one dreams about, real Buffalo mozzarella from water buffalo that actually roam around a farm in Wellington, fresh pomegranate juice, papayas from Swaziland, and the last of the artichokes. Run by the “neighbour goods market”, the producers are generally expected to attend their stalls in person. The organisers favour fresh, seasonal, organically grown, and artisanal food products, but it is a gourmet market at heart; I noticed some purveyors of flown-in fine foods. Piped music from the 1920s plays; children eat shucked oysters; organic food is still a preoccupation of the urban elite. The health dimension is clearly an important marketing hook too, with antioxidant the buzzword. Many of the producers have sidelines of homeopathic remedies. A few inquiries and I had found miraculous cures for all those diseases that medical science is still struggling to treat. Low sperm fertility count? Eat pollen. Mark Farah, a beekeeper, has created special screens that knock some of the pollen off his Cape honeybees when they return home. You can buy bottles of the male gametes of wild dandelion and pincushion proteas at his honey stall. Unlike commercial honey, which is mostly from eucalyptus or fruit orchards, Farah’s gourmet bees have hives in pristine sites around the Cape and up the West Coast, kept well away from agriculture. His delicious range is well worth sampling. Cheryl Castelein’s Funki Fungi mushroom stall is another treat. The ubiquitous mass produced button mushrooms you find in supermarkets spawn cheerfully on manure. Trying to produce shiitake and oyster mushrooms, which grow on sterilized wood chips, is another matter. The capital intensive process requires strict control of humidity, light and temperature. Pickers in the pine forests of Mpumalanga and the Natal Midlands supply her stall with wild mushrooms, and in the rainy season from the Cape mountains cep (porcini) and pine ring mushrooms. Sometimes they bring her wood blewits, known as chicken of the woods, a large bracket type yellow mushroom, named for its taste. She also sells delicious wild mushroom paté and truffle oils. 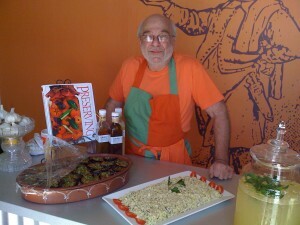 On your way in or out, don’t miss Oded’s Kitchen, home to international chef, Oded Schwartz. He has a fascinating and unique range of preserves, sauces and pickles. He has just come up with a chocolate braai marinade (R85 for a 500ml bottle) that looks set to be a sensation this summer. Beside the grocery stalls, there are numerous stands serving cooked food, This being Cape Town, you’ll find: a ‘French patisserie’, ‘Simply Italian’, ‘Touch of Greek’, the Belgian waffle stand, Flammkuchen (an Alsace version of a pizza), sushi, tuna burgers, bagels, a charcuterie with Spanish style sausages, and a smoothies bar. Never shop hungry, so before the crowds arrive, take breakfast here at one of the communal wooden tables. It’s a great start to the weekend. Neighbour Goods Market, The Old Biscuit Mill, 373 – 375 Albert Road, Woodstock. Saturdays from 9am to 2pm. For more info: Tel:021 448 1438.